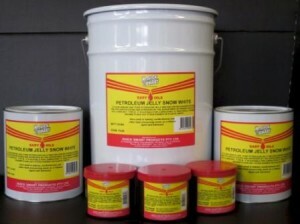 Petroleum Jelly Snow White is a highly purified white petrolatum. Non-staining. The purity and chemical inertness of the product reduce staining. Recommended for use in leather finishes, the protection of battery terminals, suitable for lubricating O’Rings, plastic parts, rubber grommets etc. Easy application and removal. It is applied by brushing or smearing and removed by wiping or by solvents such as kerosene or white spirit.